I found some beautiful old pallet wood here on the island. It had so much texture, was very heavy and different shades of grey. Until I cut into it I had no idea what wood it was. It turned out to be red oak. 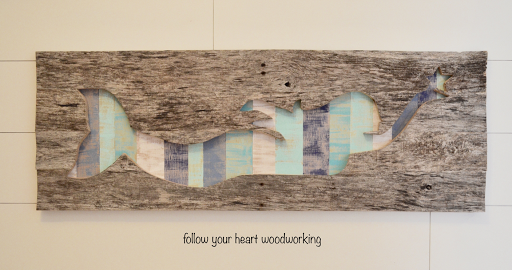 I glued four strips together side by side and then cut out a mermaid shape with my jigsaw. 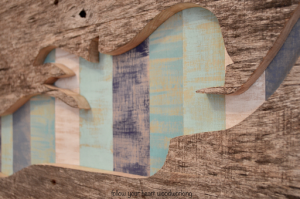 On the back I pin nailed strips of different widths of thin plywood that I painted and distressed in blue, turquoise and white. I sold the piece, but the customer wanted it personalized to hang in her cottage. This piece is 37″ long x 13″ deep. I love the reverse cut out mermaid Julie! I love the colors. This is lovely Julie. You are very talented!! I'm so jealous of your jigsaw mastery! This looks great and, as we know, I'm all about stripes! Great find with that wood – beautiful. Gosh Julie … I hope you get this message! I was going through my LJ mail and found your message to me from WAY back!! Copied and pasted (seems we’re both good at that 😂) your website hoping I could find something … and voila!! I love, love, love your woodwork and was definitely happy to see you all set up in your own workshop, because at the time of your last message, you had just moved and loved being on PEI even though you had to leave your workshop behind. I would love to communicant with you more often … “see” the inside of your shop, more of the landscape of the Island I love and miss! Is your shop combined with your house? The old style of home and shingle siding speaks to me! !